Guess they were. Shouldn’t have been. And yes, you’re safe. This is NOT more hand-wringing about American gun violence. It’s not even about my bride’s violent dismay at a quick tour of the TV landscape last night, though her horror at what passes for normalcy was real enough. (Our brief fling with hotel television – mainly Olympic coverage – was a side benefit of our one-night stand anniversary getaway.) This was in another sporting arena, a modest one and far from Rio, where a team known as the Shockers¹ were in for a surprise. ¹And I do know, the Wichita State team name is not about horror movie results or bad interactions with electricity. It’s a Kansas thing. It’s a wheat thing. 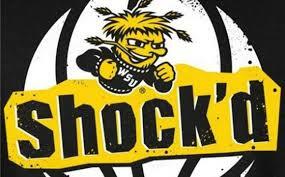 No shock for me, though, especially once I knew that Fred VanVleet and Ron Baker from last year’s NCAA Tournament “Sweet 16” team had indeed completed their eligibility² at Wichita State, a strong fixture in recent bouts of March Madness. Surely, too, Coach Gregg Marshall was better prepared than he let on in a pre-trip press conference in Wichita, before heading off to Canada for a four-game pre-season tour. He must have known about the reputation of Ottawa’s Carleton University Ravens, not only their twelve Canadian Interuniversity Sport titles in fourteen years, but their tendency to beat NCAA teams when they come north. ²I wish I could more confidently write “graduated” rather than “completed their [athletic] eligibility”. The Shockers’ first game was in Montreal, and they dismantled the UQAM Citadins – ostensibly a peer to the Ravens, a CIS squad competing for national honours – 54-18 in the first half on the way to a 50-point win. But surely they’d heard about Wisconsin or Memphis or Indiana (and many others) coming into Ottawa and losing in prior summer junkets by top-drawer Division 1 teams? Of course they had. They weren’t driving blind, but it didn’t matter a bit. As my buddy Seb grinned as the game got out of hand, “I always like to look at the bench of the D1 teams as it sinks in what’s happening to them. Getting rocked by Canadians?” Meanwhile, a less-heralded Stetson University (Fla.) Hatters team had been on the verge of being blown out by the Ravens the previous Friday evening, but managed to keep the score respectable, losing by 9. Beating the Americans is actually fairly routine for the Ravens. They’re used to this WINNING thing – but don’t tell me those non-scholarship lads don’t take sky-high pleasure in schooling the Americans at the game they’ve dominated for so long. (They do get financial aid, many of them, but it’s no “full-ride” athletic scholarship. And yes, that’s an oxymoron, but nobody notices anymore.) And longtime readers of this site will know that I’ve written this story before. Most recently, the twin killings of Josh Pastner’s Memphis Tigers two summers ago made me wonder. Incredible. I watched it. You should read this and then this – they show how the systematic dismantling of a bigger, more “athletic” team by a bunch of Canucks was done. They also tell most of the story, if I do say so myself, about CU’s rising dominance of incoming NCAA teams. When last your confused hoops correspondent waxed prophetic in It’s All About Sports! after the first weekend of American collegiate March Madness, when his bracket was significantly hobbled, he predicted an NCAA Elite 8 as follows. Some of them really are students, I swear. But this image is disgracefully disingenuous, not that this post really wades into that swamp of “Student Athlete” dismay. Louisville was to play Duke. Bingo! (Okay, a number one seed against a 2; it hardly ranked with Nostradamus, but I’ll take my successes where I find them.) I picked Duke to win through to tomorrow’s Final Four, because I always do, because: A) they often do, and B) I’m a Blue Devils loyalist. Coach K is great, even if he does do too much commercial shilling, and I always argue that there is a large percentage of available high school recruits that Duke can’t even consider because they genuinely need to be students in Durham. (I hope this is still true.) Louisville was just too relentless, and too quick in the backcourt, for Duke.